The 2019 iteration of Notre Dame Lacrosse will be defined by the “unknowns.” We know that Notre Dame’s close defense is extremely talented, but it is unknown how losing an All-American like John Sexton at LSM will affect their midfield defense, transition offense, and faceoff wing play. We know that Bryan Costabile and Brendan Gleason are elite offensive midfielders, but it is unknown how they will be complemented and what kind of depth Notre Dame has behind them. It’s how the Fighting Irish answer these questions and others that will determine whether they’re a championship caliber team or one that struggles to make the playoffs against a daunting schedule. 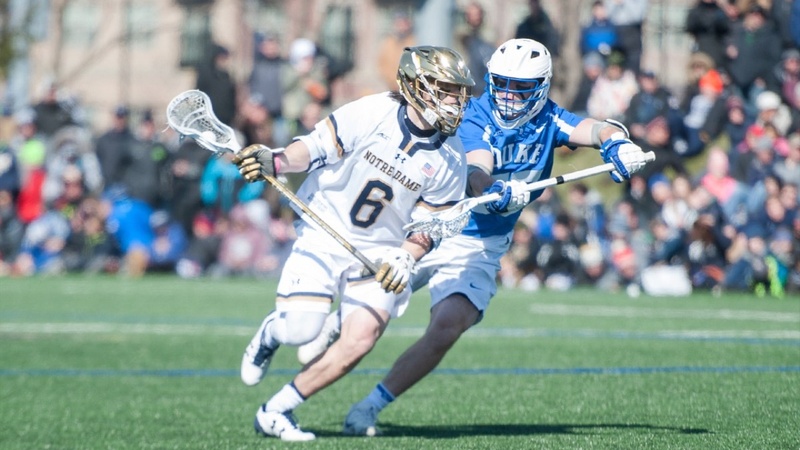 The biggest unanswered question – by far – is what Notre Dame will do at attack to try to replace leading point producer Ryder Garnsey. Notre Dame has struggled to find a consistent, dynamic playmaker at attack since Matt Kavanagh hung up his gold helmet for the last time. Garnsey was not only the most creative player on the Notre Dame offense, but was having a stellar fall and was primed to be a consistent playmaker in the spring. With Garnsey being declared academically ineligible for the 2019 season the Irish lose their best initiator and facilitator at attack with no proven “Plan B” on the roster. The only returning starter for the Irish is the big righty Brian Willetts who was primarily an off-ball scorer in 2018. The Irish also lose proficient inside finisher Mikey Wynne from a year ago, meaning the attack group as a whole will look starkly different from what we saw last spring. Wheaton Jackoboice – a versatile lefty who can also play midfield and played mostly on man-up in 2018 – is likely to get a starting spot somewhere on the offense to help balance the field opposite Willetts. Beyond that, Notre Dame is likely to look towards Connor Morin and Mikey Drake to help carry the load. At midfield, things are more settled with veterans Bryan Costabile and Brendan Gleason headlining what could be a deep group despite a lack of proven contributors. Notre Dame has a bevy of talented freshman that are likely to compete for immediate playing time, as well as combo players like Jackoboice and Drake that could get runs at either midfield of attack. Notre Dame used many different line combinations in the offseason and spring scrimmage against Air Force which indicates that who plays alongside Costabile and Gleason is likely to fluctuate as the season progresses. The one niche position that looks to be a continued strength is defensive midfield where Drew Schantz is one of the best two-way threats in college lacrosse. Despite losing transition threat John Sexton at LSM, Eric Restic and freshman Jose Boyer should both be more than capable getting the job done on the defensive side of the field. Look for Notre Dame to deploy converted LSM Charlie Leonard at the faceoff dot alongside Kyle Hyland. Both are the epitome of question marks – Leonard because of his move to shortstick, and Hyland because he has been snakebit by injuries since arriving in South Bend. The one unit that lacks question marks is the Irish close defense. A veteran lineup of Hugh Crance, Jack Kielty, and Arden Cohen looks to be about as formidable as any close defense in the country. Matt Schmidt should take a step forward in the cage as a sophomore after an inconsistent freshman year. There is not much to say about this position group except that they’re very skilled, very well coached, and unlikely to be the group of players that gets Notre Dame beat. If Matt Schmidt can get his save percentage closer to 55%, then the Irish should have one of the top 5 defenses in the country and very few teams should score double-digit goals against them. Against a challenging schedule with no breaks, the ability for Notre Dame to win tight games is likely riding on whether they can find consistent playmakers at the specialist positions and attack. Can they find a player at attack that they can count on in big moments? If their attack is good enough to keep teams honest, it’s going to be extremely hard for them to defend Costabile and Gleason. Can they generate enough transition offense without Sexton? Can they win key faceoffs late in games against elite teams? One unknown factor is how the shot clock will affect a Notre Dame team that has recently been much more effective against fast teams (i.e. Virginia) than against those that play intentionally slow (i.e. Denver and Marquette). If the shot clock has a big impact on speeding up the game, expect Notre Dame’s athleticism and talented two-way midfielders to excel. The season starts with two winnable games – hosting Detroit on February 16th, and traveling to a good Richmond team on February 23rd. After that, it’s a proverbial murderer’s row… the schedule features nine ranked teams in eight weeks, many of those games involving cross country flights. Add all of this up – extensive travel, virtually no cupcakes, six of twelve games against teams ranked higher than them – and Notre Dame has virtually no margin for error if they want to finish with a resume good enough for playoff inclusion. Notre Dame has the talent and coaching to beat every team on their schedule, but there are a whole lot of question marks between them and a championship. In one week, we get our first real answers.